The Toyota ME.WE concept presents a vision of the car of the future – and you can take a close look at the concept for yourself from Wednesday, as it goes on display in London. 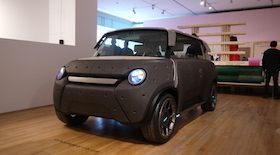 The concept car combines sustainable materials, clever in-wheel motor technology and leading-edge design thinking, so it’s no surprise that it’s one of the star attractions at the London Design Museum’s Designs of the Year exhibition. Appropriately for a forward-thinking show, you can get involved by backing your favourite design as part of a social vote to crown the public’s favourite Design of the Year. The vote pits two designs again each other every day at designsoftheyear.com. You can cast a vote for your favourite via Facebook or Twitter. The ME.WE will feature in the voting on Tuesday, April 22nd – so don’t forget to have your say! We’ll be publishing more on the ME.WE later this week, including an interview with its creator Jean-Marie Massaud, so don’t forget to check back for more. The Designs of the Year 2014 exhibition at the Design Museum begins on Wednesday, March 26th and runs until Monday, August 25th. The Design Museum is located at 28 Shad Thames, London, SE1 2YD and you can find more details on the show and buy tickets at www.designsoftheyear.com. More: See our video about how the ME.WE was developed on YouTube. More: See the ME.WE in action on YouTube.